Education and knowledge became important cornerstones of the United States after the American Revolution. Knowledge in the common citizen was an important ideal of the new republic, and an essential feature to its continuance. Early in the 19th Century, people began to realize that the best way to educate the public was with free public schools. Prior to this, most teachers taught privately or in academies, usually available to only the wealthy citizens. In the 1820s and 1830s, common schools became prevalent in the cities and rural towns of the United States. But there was a problem that first had to be addressed - who would train the teachers for these schools. Most common school teachers had minimal training, and many were only educated at the common school level. Teaching tenures were often short - men usually taught only until they found a higher paying job, and women only taught until they married. For true improvements in education, improvements were needed. In 1832, the state of Massachusetts began its first normal school, a school for the express purpose of training teachers. The school proved to be a success, and by 1844, the state had 3 normal schools, albeit small ones. Government officials and educators in New York State saw the success of Massachusetts, and decided to experiment themselves, with a larger school. The Albany Normal School opened in 1844 in a refurbished railroad depot. Part of the reason it was located in the state capital of Albany was so the state government watch over its experiment. The school was a success, and by 1848, was granted permanent funding. The school grew rapidly in size, to nearly 250 students, a number equal to all 3 Massachusetts schools combined. 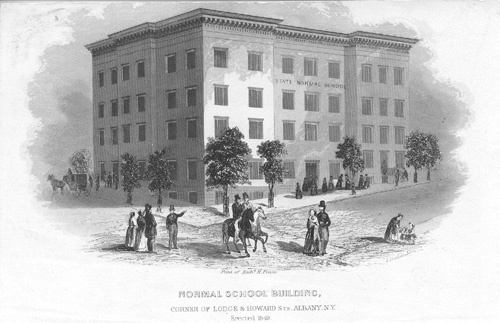 In 1849, the school moved to a brand-new building in downtown Albany. The building had separate entrances for men and women, reflecting the customs of the times. Students came from throughout the state, and a majority were men. Many would be considered to be what today are considered non-traditional students. Many new students had already taught in the common schools and came to the Albany Normal School to solidify their teaching skills. Others came from rural areas of western New York, where there were few schools of higher education, and the Albany Normal School was the only opportunity for many of them to get an extended education. The school continued to prosper, and the state opened other normal schools. Only a small percentage of the students ever graduated from the two-year program, however, as many left to teaching positions before their graduation. Some graduates would teach for many years, and some became principals or went out west to found other normal schools. Some never taught, instead returning to the family farm, or choosing another profession. Several Albany Normal School Graduates became lawyers, doctors, and ministers. Rodney Kimball joined the faculty of the Normal School in 1855, about the same time a recent graduate, Albert N. Husted, was appointed an instructor at the school. The two math professors forged a friendship. School enrollment withstood the initial fervor of the enlistments at the beginning of the war, when most Northerners believed the war would be quickly over, and the students believed they could continue their own education. But the early failures of the Union Army in Virginia spurred the realization that a greater effort was needed to preserve the Union. Lincoln issued a call for 300,000 men on July 16, and by July 28, both Kimball and Husted had resigned their positions. They mailed circulars to their favorite students, both current and past. In all, 25 young men from the Normal School joined their teachers in the "Normal School Company." That number was not nearly enough to sustain an entire company, which required about 100 men. The students were encouraged to convince their friends and relatives of high character, to join. Kimball recruited his friend Eugene Douglass, a minister who had recently returned from a long tour of Europe. Undergraduate Sidney Burroughs from Varick, New York, convinced his friend James Sperling, brother-in-law James Woodworth, and his father's laborer, Charley Updike to join the company. Thompson Barrick, an 1861 graduate and neighbor of Sidney Burroughs, his brother John, an 1860 graduate, and Cyrus McDuffee, another current student, joined a total of 19 men from Seneca County in the Normal School Company. A second call for 300,000 men made by Lincoln during August and the threat of a draft if that number of enlistments was not met, helped to convince the men to join. Men from Albany and North Greenbush (some of who may have been friends with the students), and a group of 12 men from Schoharie County, who had been too late to join the 134th Regiment in their own county filled out the company. After the men left, life at the Normal School continued. Two professors were hired to replace Kimball and Husted. Male enrollment shrank due to the war and a surplus of teaching positions due to teachers leaving for the war, leaving a primarily female enrollment. This allowed the school to transform education, as female teachers were considered calmer, more patient, and better equipped to instill the values necessary for a successful republic into their students.